One of the biggest revelations of my life came in the 10th grade. My German teacher decided to let us know that Oktoberfest really mostly happens in September. Shocking! 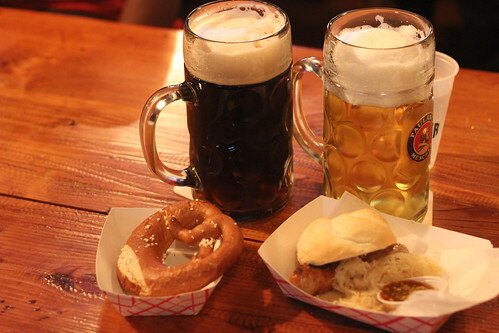 Seeing as I love sausages and beer, I felt the need to celebrate such festivals this past weekend at New York's newest beer hall, Die Koelner Bierhalle in Park Slope. Frat boys and babies galore, folks. Entering Die Koelner on a Saturday afternoon can be a bit intimidating and extremely overwhelming. Loud music, parties, babies, drunk yuppies, and full communal tables await you--I had to flag down the busboy and a waitress to help me figure out where to sit. Once seated, you can get table service for beers, but not for food. Instead, you get to give up those seats, head to the back grill, order, and wait for your food. All the while hoping that your seats haven't been taken. 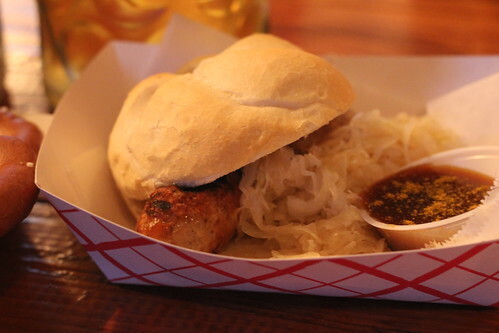 With my aforementioned love of sausages, I decided to get a currywurst on a Kaiser roll, and a small pretzel. The currywurst was fine enough--a solid log of processed meat with no distinguishable origin grilled until blistered and lacking all the admirable attributes I've come to love from eating fresh sausage. At least the sauerkraut is homemade? Let's not discuss the sorry example of a Kaiser roll I was served nor the stale pretzel I reluctantly ate due to extreme hunger. The saving grace of the entire experience was the overworked though still friendly waitress and liters of beer. Everybody loves a good liter of beer. I haven't yet been there on a weekend afternoon, but I've been there on weeknights, and you can't really get beer WITHOUT sitting down and having waitress service. Great selection of beer, though (and I had a non-stale pretzel which was delish), it's just a bit of a hassle to get beer. I'm giving them some more time to settle in, though, since they're still new. And yes, the liters of beer is a saving grace. I'll have to check this place out the next time I'm in Brooklyn..